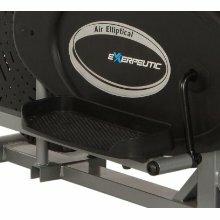 Exerpeutic Aero Air Elliptical Reviewed! The Exerpeutic Aero Air Elliptical trainer is the perfect trainer for you if you're short on space and have a limited budget! 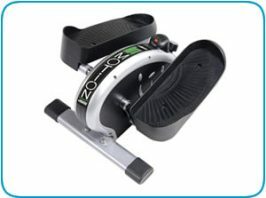 This entry level machine will give you a great low impact upper and lower body workout that can be made more challenging by adjusting the dial tension - you can vary your workout as it has the ability to stride with a backwards motion and with the dual action arms you're going to get a workout that hits most of your muscle groups! 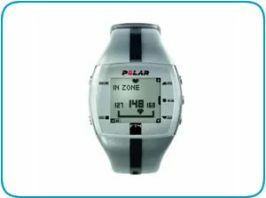 Wheels make this trainer easy to move and store plus there's an easy to read LCD screen to track your workout. 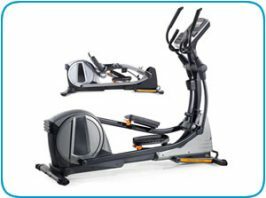 The company Exerpeutic (part of Paradigm Health & Wellness Inc) offer high quality products at good value prices and this elliptical is both compact and affordable coming on the market under $100!! 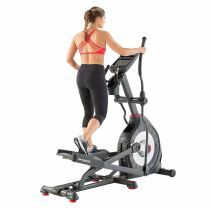 At this price you won't get all the fancy features more expensive machines offer, but you will still get a great upper and lower body workout at a much lower cost, and often in a much smaller footprint. 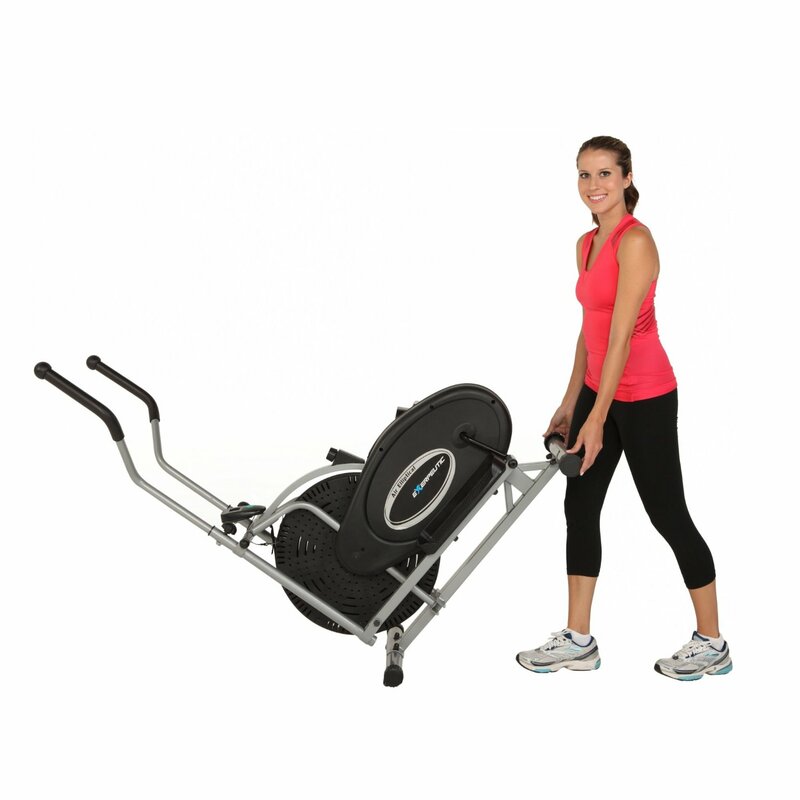 The natural elliptical motion of this trainer eliminates any stress on joints. 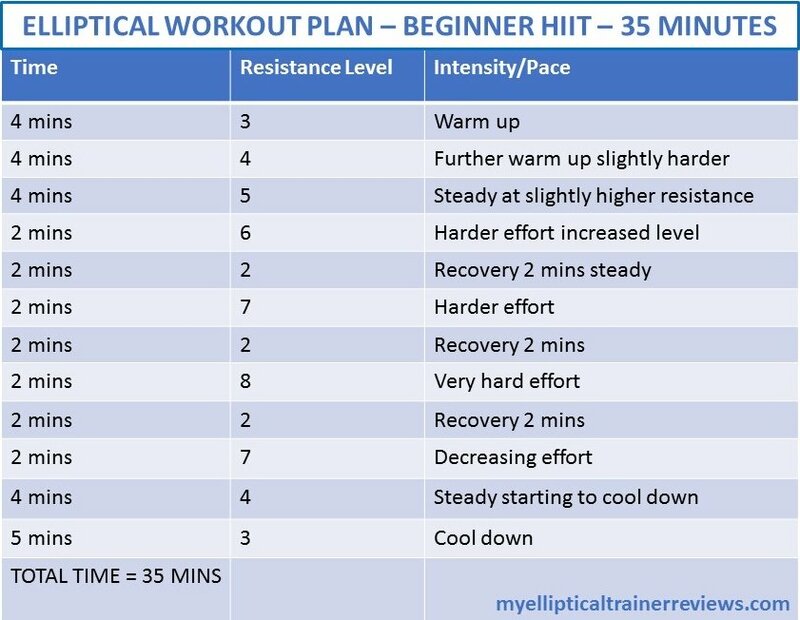 This gives you a complete cardio workout and works multiple muscle groups too, giving you a very smooth ride and not a bumpy one that some budget elliptical trainers offer! 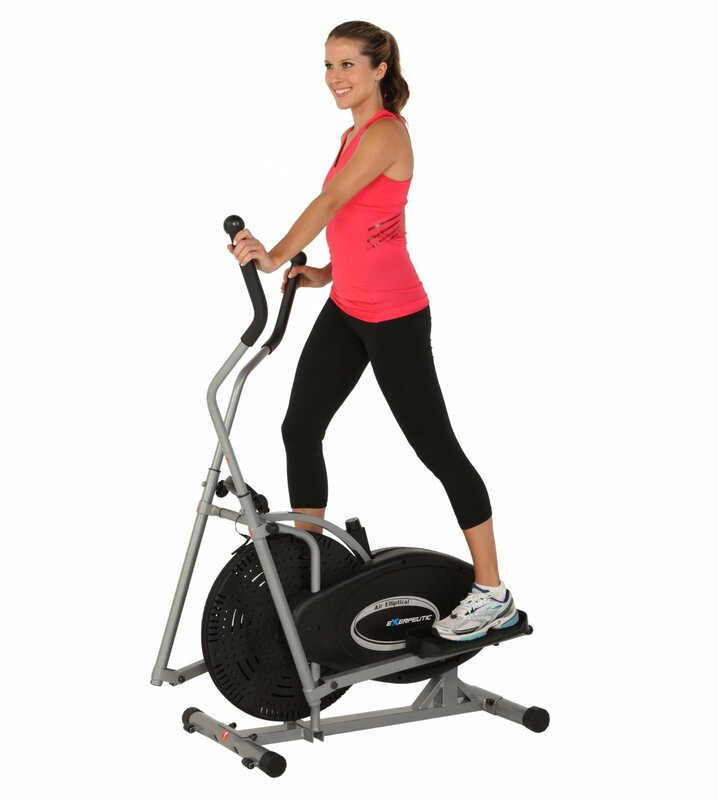 The Exerpeutic Aero Air Elliptical has a larger pedal design with built-in ridge design to prevent foot slippage when exercising. 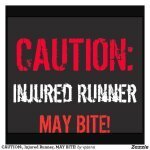 This can only add to the comfort of your workout. The Exerpeutic Aero Air is virtually silent!! I reckon you could watch your favorite TV program while working out on this home exercise machine. I did try it with an exercise mat underneath though - click here to find out more about my recommended mats to both protect your floor and minimise noise levels. This trainer uses strap resistance and what I love about the Exerpeutic Aero Air elliptical is the easy dial tension adjustment so you can up your workout and make it more challenging, or on a day when you're feeling the burn too much, you can ramp it down a bit!! Adds an upper body workout to your home exercise routine. I feel this is perhaps the best feature of this budget machine - it's small footprint makes it ideal if you live in a small apartment or have limited exercise room. It really is a space saving machine! The machine has a user weight capacity of 220 lbs. There is nothing better than being able to move your exercise machine around your apartment or living space as and when you wish. The transportation wheels make this really easy - they are at the front end, making it simple to move and store your trainer. One year limited warranty - see more info below. The Exerpeutic Aero Air Elliptical takes about 30 minutes to assembly - to be honest the manual could be slightly better - it may take an hour if you are not a DIY person good at assembly! So an hour max and you're ready to roll! Watch out - some parts are hidden in the sterofoam so look closely to find them. 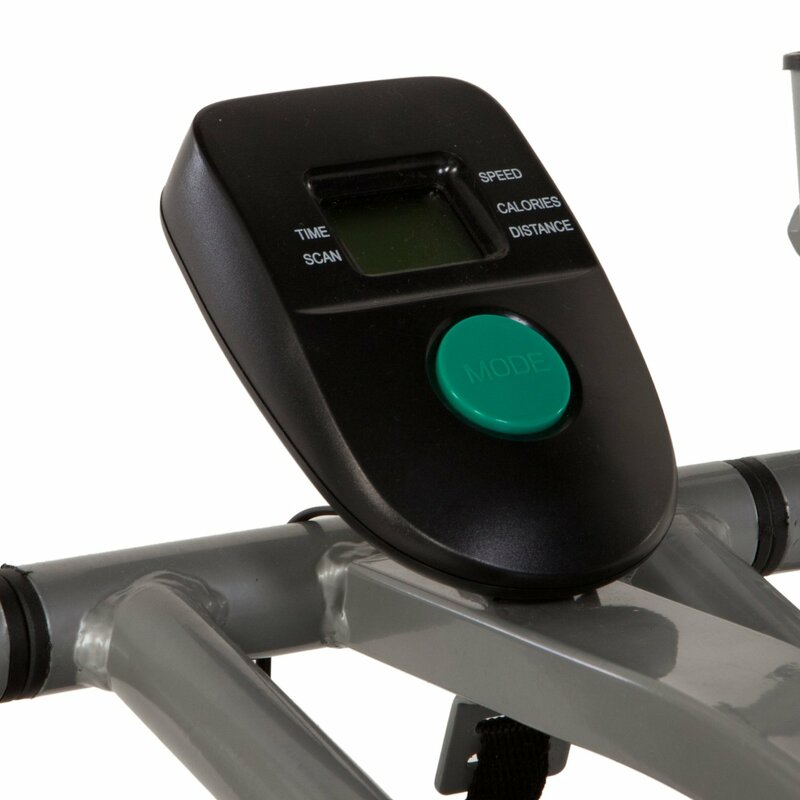 Be aware this is a budget machine and you need to keep on top of maintenance of your elliptical trainer, especially if you are exercising lots! 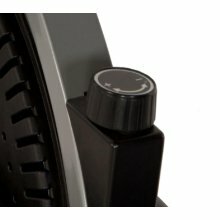 Look out for those loose screws and keep everything tightened up - read more about care of your elliptical machine here. Keep your machine in good shape and it will last you a long time and keep you in good shape!! Your new Exerpeutic Aero Air ships in at 59.2 lbs and once assembled, weighs in at 55 lbs. Once assembled your new Exerpeutic elliptical trainer footprint will measure 33 x 19 x 46 inches (LxWxH). Weight capacity for this elliptical machine is 220 lbs and stride length is 12". The measured point when the pedal is at its highest is 17" - this gives you an idea of the compact size of this machine if you are planning on putting it in a small sized apartment or basement. Handlebars are adjustable - perfect for my friend who tried this machine and is over 6ft tall! You can take out an extended warranty policy - I have written a page with detailed information on this that can be found here. Some people prefer a stride length greater than 12" - taller exercisers often look for an 18" stride, however you can get a great workout on a 12" stride machine, as my tall friend who tried this model proved! So the final word on the Exerpeutic Aero Air Elliptical Trainer is....if you don't want to spend a fortune and are looking for a budget but good quality machine, that is also a space saver, then this is the elliptical trainer for you!